Until a couple of weeks ago, Ahmed Mohamed was an unknown 14-year-old student at MacArthur High School in Irving, Texas. But on September 14th, everything changed for him. On that day, he was excited about a clock he had made at home all by himself. He brought it in to show his engineering teacher. She was impressed, but told him not to show it to any of the other teachers in the school. Unfortunately, he did not take her advice. Some of the teachers thought the clock looked like a bomb, and the school called the police to have Ahmed arrested. School officials knew that it was not really a bomb. Instead, they thought he had made a fake bomb to scare people, which is also against the law. The Irving police led Ahmed out of MacArthur High in handcuffs. Although they released him after a little while, Ahmed was suspended from school for a few days. But then something amazing happened. News of Ahmed’s arrest spread around the world. 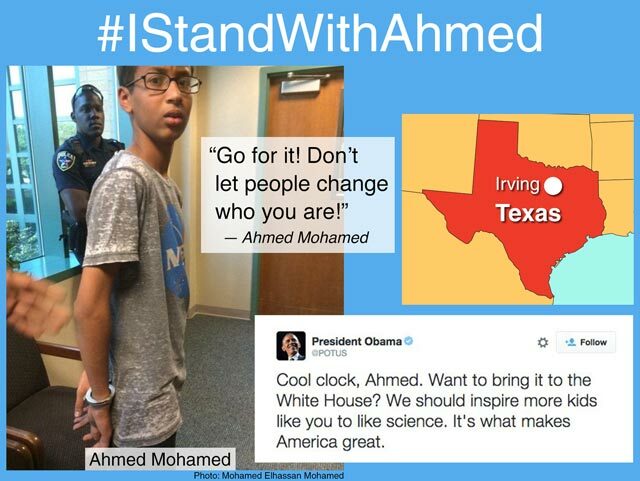 People started sharing the story on Twitter and Facebook with the hashtag #IStandWithAhmed. Many people were upset that such a creative student could be arrested and then suspended from school. And many were convinced that Ahmed was targeted because he is Muslim. Soon, Ahmed was swamped with messages of support from around the U.S. and the world. Companies and colleges offered him jobs and scholarships. He also received a Twitter invitation from President Obama to visit the White House. Through it all, however, Ahmed maintained his composure. At a press conference, he told other young people, “Go for it! Don’t let people change who you are!” At press time, however, Ahmed’s father — a two-time presidential candidate in Sudan — had announced that Ahmed will be switching schools. What do you think? Was Ahmed suspended unfairly? Do you think he was targeted because he is Muslim? Share your ideas in the comments! Previous Bubble A for No: The Injustices of Standardized Testing by Caroline T.